Ehud Barak (Hebrew: , born Ehud Brog; 12 February 1942) is an Israeli politician who served as Prime Minister from 1999 to 2001. He was leader of the Labor Party until January 2011. He previously held the posts of Minister of Defense and Deputy Prime Minister in Benjamin Netanyahu's second government from 2009 to 2013. He is the joint most highly decorated soldier in Israel's history, having taken part in many battles and combat missions. He is a graduate in physics, mathematics, and economics from the Hebrew University of Jerusalem and Stanford University. He served as an officer in the Israel Defense Forces. Following a highly decorated career, he was appointed Chief of General Staff in 1991, serving until 1995. On 26 November 2012 he announced that he would retire from politics after the next election in January 2013. He was born on 12 February 1942 in kibbutz Mishmar HaSharon in what was then Mandatory Palestine. He is the eldest of four sons of Esther (née Godin; 25 June 1914 – 12 August 2013) and Yisrael Mendel Brog (24 August 1910 – 8 February 2002). Ehud hebraized his family name from "Brog" to "Barak" in 1972. It was during his military service that he met his future wife, Nava (née Cohen, born 8 April 1947). They had three daughters together: Michal (born 9 August 1970), Yael (born 23 October 1974) and Anat (born 16 October 1981). Barak divorced Nava in August 2003. 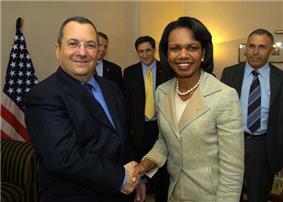 On 30 July 2007, Barak married Nili Priel (born 25 April 1944) in a small ceremony in his private residence. In his spare time, Barak enjoys reading works by writers such as Johann Wolfgang von Goethe, and he is a classical pianist, with many years of study behind him. Barak joined the Israel Defense Forces (I.D.F.) in 1959. He served in the IDF for 35 years, rising to the position of Chief of the General Staff and the rank of Rav Aluf (Lieutenant-General), the highest in the Israeli military. During the Yom Kippur War, Barak commanded an improvised regiment of tanks which, among other things, helped rescue paratrooper battalion 890, commanded by Yitzhak Mordechai, which was suffering heavy losses in the Battle of the Chinese Farm. During his service as a commando in the elite Operation Entebbe, another rescue mission to free the hostages of the Air France aircraft hijacked by terrorists and forced to land at the Entebbe Airport in Uganda. These highly acclaimed operations, along with Operation Bayonet, led to the dismantling of Palestinian terrorist cell Black September. It has been alluded that Barak also masterminded the Tunis Raid on 16 April 1988, in which PLO leader Abu Jihad was killed. Later he served as head of Aman, the Military Intelligence Directorate (1983–85), head of Central Command (1986–87) and Deputy Chief of the General Staff (1987–91). He served as Chief of the General Staff between 1 April 1991 and 1 January 1995. During this period he implemented the first Oslo Accords and participated in the negotiations towards the Israel–Jordan peace treaty. Barak was awarded the Medal of Distinguished Service and four Chief of Staff citations (Tzalash HaRamatkal) for courage and operational excellence. These five decorations make him the most decorated soldier in Israeli history (jointly with close friend Nechemiah Cohen and Major Amitai Hason). 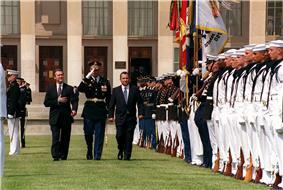 In 1992 he was awarded the Legion of Merit (Commander) by the United States. In 2012, he was again awarded by the United States with the Department of Defense Medal for Distinguished Public Service. On 22 August 1999, Barak appointed the Tal committee which dealt with the controversial issue of ultra-Orthodox Jews' exemption from military service. Following the failure of the Camp David summit with Arafat and Bill Clinton on summer 2000, when the original 7 years mandate of the PNA expired, and just after Israel pulled out its last troops out of southern Lebanon in May 2000, the weeks-long Riots in October 2000 led to the killing of twelve Israeli Arabs and one Palestinian by Israel Police and one Jewish civilian by Israeli Arabs. 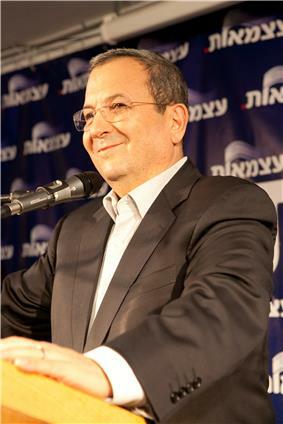 After winning back the leadership of the Labor party, Barak was sworn in as Minister of Defense on 18 June 2007, as part of Prime Minister Olmert's cabinet reshuffle. However on 1 July 2007, Barak led a successful effort in the Labor central committee to stipulate that Labor would leave the government coalition if Olmert did not resign by September or October 2007. At that time the Winograd Commission would publish its final report on the performance of the Israel Defense Forces and its civilian leadership. The preliminary Winograd report released earlier this year laid most of the blame on Olmert for poorly planning, executing, and reviewing war strategies in the 2006 conflict against Hezbollah. Labor won only 13 out of the 120 Knesset seats in the 2009 elections, making them the fourth largest party. Barak and other Labor officials initially stated they would not take part in the next government. However, over the objections of some in the Labor party, Barak later reached an agreement under which Labor joined the governing coalition. 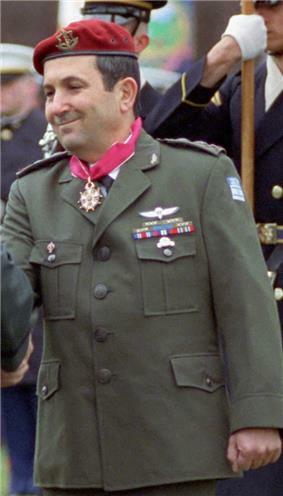 Barak retained his position as Defense Minister. In February 2011, Barak attended a ceremony at the UN for the International Day of Commemoration in memory of the victims of the Holocaust. Barak told the UN General Assembly: "an independent, strong, thriving and peaceful State of Israel is the vengeance of the dead. On this day, when we remember the six million victims, let us also remember two lessons: first, 'the Holocaust – never again.' And second – an independent, strong, thriving and peaceful State of Israel is the vengeance of the dead." In an interview with Haaretz reported in January 2015, Barak was asked to explain the source of his "big" capital, with which he "bought 5 apartments and connected them," and by which he "lives in a giant rental apartment in a luxury high rise." Barak said he currently earns more than a million dollars a year, and that from 2001-7, he also earned more than a million dollars every year, from giving lectures and from consulting for hedge funds. Barak also said he made millions of dollars more from his investments in Israeli real estate properties.